Travel is limited to a maximum of 260 miles/night averaged over your trip. (130 miles/night are included in your rates, but additional mileage up to 260 miles/night is available for purchase). Travel into death valley is not allowed May-September. Travel to Mexico, Black Rock Desert, NV, or the Burning Man festival is not allowed at any time. Playa dust from is corrosive to sensitive electrical systems and very difficult to remove. I know, you are picturing this but we are picturing this. 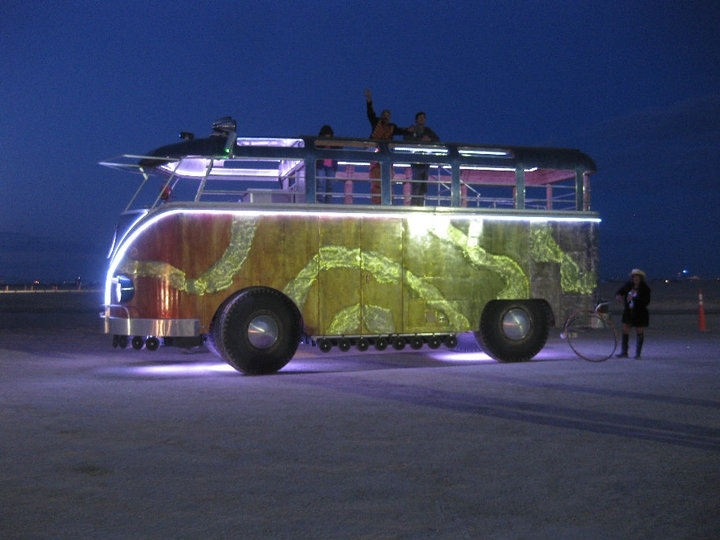 If you take a camper to burning man festival you will forfeit your security deposit in full and you agree to purchase the vehicle at the fair market value prior to your trip, due to the potential for future deterioration of the vehicle and its systems. 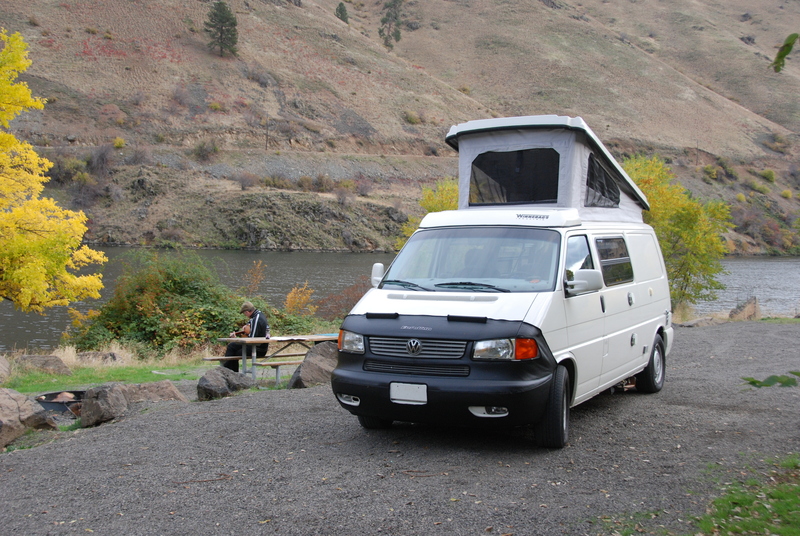 You should not plan continuous drives longer than 6 hours in a day for a Eurovan or 4 hours in a Vanagon. These campers are meant for enjoying the ride and taking your time. There are instances where a longer drive can be accommodated. If you are planning on longer drives please contact us to discuss and to get permission to do so. These are not off-road vehicles. Unimproved roads, high clearance, closed roads, trails, 4x4 trails and tracks are not permitted at any time. Due to a very steep grade, driving up/down Pike’s Peak is not allowed, nor is any other road that requires downshifting for descent. Unpaved state and federal forest roads are permitted if they are currently maintained and well-graded, in good condition and passable by non-4wd/regular passenger vehicles. Exercise caution and good judgment when traveling on such roads, as the lessor is liable for any major paint, tire, window or other damage. Driving slowly will help to avoid such damage. Good Judgment. Bad Judgment. If a breakdown occurs in any restricted areas due to driving the vehicle more than is allowed in one day (see travel restrictions), or due to bad judgment, the lessee will be liable for all towing and repair costs, their security deposit may be forfeited and they will not be reimbursed for the remainder of the rental contract. If a breakdown requires towing by a 4x4 vehicle or extraction vehicle, it will be automatically determined that the camper was taken into an area/road not permitted and the lessor will be responsible for 100 percent of the associated towing costs as well as any mechanical/physical damage to the vehicle caused by driving on such roads, as well as a service to the shocks, struts and alignment. All drivers must possess a driver’s license (valid for the entire rental period) and be present at time of vehicle pickup. An international driver’s license is recommended for foreign tourists and may be required if you will be purchasing insurance collision coverage. All drivers must be at least 21 years old. Renters aged 21-24 are subject to additional verification requirements for insurance purposes. Only drivers listed on the Rental Contract are allowed to drive. A $1000 security deposit is required at time of vehicle pick up. Security deposits are held subject to the terms and conditions of the Rental Agreement and are fully refundable less any damage, loss of equipment, excess cleaning, refueling, excess mileage and any outstanding fees. All Colorado rentals are subject to a $2 per day Colorado Rental Car fee (Colorado Road Safety Program) and a 3% city sales tax. Rentals departing from Las Vegas are not subject to additional taxes at this time. There are no fees for additional drivers or prep fees. There is a 3% credit card processing fee for international credit cards. Vehicle pick up & return is by the applicant only and is by appointment. A rental day is defined as a 24hour period. If you pick up your van at 3pm on your first rental day, then it is due back at 3pm on your last rental day. Vehicles returned late will be assessed a fee. We charge $25.00/hour past the rental return time. Returns more than 2 hours late will be charged an additional ½ night. Returns after 6pm will be charged an additional night. Pick ups are available every day of the year except major holidays between 8am-5pm M-F and 9am-4pm on Sundays. In the event of a travel delay we will work with you to accommodate you as best as possible. Late or early pick ups are sometimes available for a fee. After hours drop offs are available any time. We provide a comprehensive vehicle orientation prior to each rental, which the primary renter shall sign as evidence of receiving operation instructions. Click here for information on how to get to our office locations from the airport. 8-30 days prior to your reservation: cancellation fee is 50% of your total rental fees or $250, whichever is greater. Cancellation of any nights within 8-30 days are subject to 50% of the nightly rate for each cancelled night or $250, whichever is greater. 0-7 days prior to your reservation: You will be charged 100% of your rental fees to the payment method on file in the case of a “no show” or cancellation within 7 days. Reservations can be extended at any time for no fee, subject to availability. In addition to the above policies one way fees are non-refundable at the time of booking. Provide Your Own Coverage (available to renters aged 21+): $0/day – Provide your own coverage* – US and Canadian residents with full auto insurance coverage that covers rentals (liability, comprehensive and collision) or International renters with travel auto policy coverage. Please check your coverage with your insurance provider prior to booking. You will need to provide us your insurance information or travel policy information prior to your rental. Renters aged 21-24 are subject to additional insurance requirements. Please inquire for details. Purchase Comprehensive and Collision Coverage (available to renters aged 25+): 7-16% of nightly rental rate as quoted by our insurance provider – Full Comprehensive, Collision Coverage & minimum statutory liability coverage in the states in which you will be driving ($75,000 in coverage on vintage campers, $200,000 in coverage on more modern campers. Deductible varies from $500-1500 with vehicle value.) Collision coverage is only available for our renters age 25+. A driver’s license check will be done to verify coverage at no cost to the renter. International renters may need to have a international driver’s license to qualify for collision coverage. Most countries are only required to submit copies of a driver’s license and a passport. $1,000,000 Supplemental Liability Insurance (SLI**) at the rate of $6.95/day for renters aged 25+ from all locations and at the rate of $15.95/day for renters aged 21+ from Colorado only. *Additional documentation may be required upon request. Insurance provided by credit card companies is generally not valid as they do not cover vans. **SLI is excess liability insurance that protects you and any authorized driver, as defined in the rental agreement, against third party automobile claims for bodily injury and property damage caused during permitted use of the rental vehicle. SLI Provides you with the following benefits: When you accept SLI, the policy may provide you with excess coverage for the difference between the minimum statutory liability coverage in the states in which you will be driving and $1,000,000. In the unlikely event of an accident you must call Rocky Mountain Campervans LLC as soon as it is safe to do so. If you are in an accident with other vehicles, be sure to get the driver’s license and insurance information of everyone involved. If there is an injury or the vehicle is not drivable you will have to call local authorities to file a report. If you have an accident you are responsible for your accommodation expenses. We will work very hard to help you get back to your vacation as soon as possible. Rocky Mountain Campervans LLC is not liable for accidents caused by adverse weather or wildlife. It is a fact of life in the Rocky Mountain West. For that reason, we urge all renters to keep it slow in the snow and keep your eyes open wildlife. Our vehicles are regularly maintained by professional mechanics to ensure their reliability. 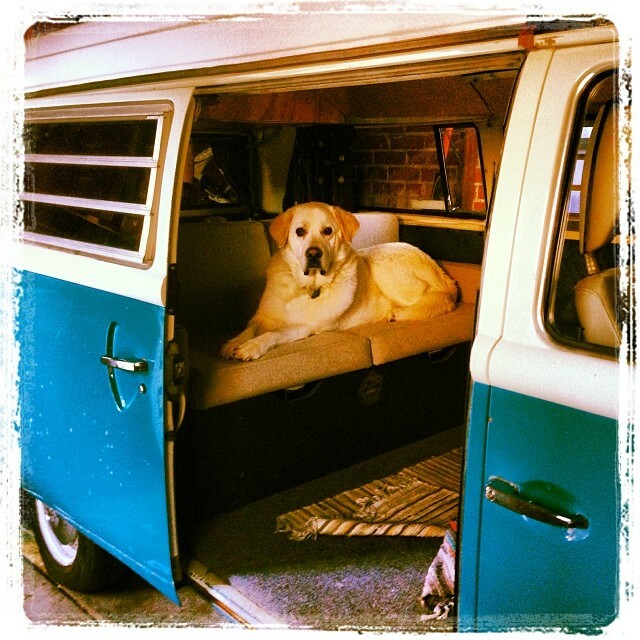 However, some of our vans are truly vintage, and from time to time mechanical and other issues may arise. In the event of an issue or if you suspect an issue you must contact us immediately. Often, problems with these vehicles only require minor fixes and we can get you back on the road without much hassle. Failure to contact us, and to either keep driving or attempt to fix the vehicle yourself without our approval, or ignoring our instructions for an assessment of the vehicle may result in loss of security deposit and will void any rights to a refund. We will cover any towing, parts, or labor needed to get you back on the road. We may refund a portion of your rental fees in the event of a lengthy repair. Rocky Mountain Campervans LLC’s liability is limited to refunding your rental fees for the remainder of your rental contract with us. In the event that we cannot get you back on the road in a timely manner we will get you a replacement vehicle if one is available. It is our policy to keep vehicles off schedule for standard maintenance and to serve as back ups. The replacement vehicle may not be the exact same type of vehicle that you started with. If it will require more than 24 hrs to repair or replace your vehicle being assessed by an approved technician, you will have the option to cancel the remainder of your rental contract for a refund of any time out of the vehicle through the end of the rental contract. At that point the customer will need to make other arrangements for the remainder of their trip at their own expense. Pets are welcome with prior approval. A $50 per pet per rental fee is required (max 2). If there is evidence of an unauthorized pet within the vehicle a minimum fee of $200 will be assessed. One way rentals are possible for an additional fee that is dependent upon the vehicle drop off / pick up locations. One way fees are non-refundable at time of booking. Please contact us for detailed pricing and options. All one way drop offs will be at the local airport. All of our vehicles are non-smoking. Please smoke outside the vehicle only. If there is any evidence of smoking within the vehicle a minimum fee of $500 will be assessed. We know, there is a lot of hype about smoking in Colorado these days. If you need more information on that subject we suggest you read up on it. If your campervan has a pop top you will be instructed on how to raise and lower your pop top properly. If upon the return of your vehicle the mattress is not stowed properly or the pop top is not latched properly as clearly demonstrated at vehicle pick up you will be assessed a $15/night fee for each night of your rental contract. Improperly stowing the bed or improperly latching the pop top causes undue stress to the pop top and its hardware. The fuel tank has to be returned at the same level as noted at departure. Always re-fill with “Premium” grade fuel for all Volkswagens. Promasters should be re-filled with “Regular” grade fuel. If you return you van with a less fuel than your departure, then refueling will be charged at a rate of $5/gallon and deducted from your security deposit. You are not required to return the propane tank full. Lessee is responsible for all speeding or parking fines, traffic infringements, road toll fines and associated fees or unpaid camping fees/fines during rental term. If you will be driving one of our vintage vehicles then speeding fines will be unlikely. We would like to remind you that the left lane is for passing (you won’t spend much time here) and the right lane is for cruising (what vintage v-dubs are made for). Windscreen damage is the responsibility of the lessee. Make sure to note prior damage. Damage to tires/wheels and the cost of puncture repairs is the responsibility of the lessee. Any associated costs, including replacement of additional tires due to damage to another tire by the renter, is the responsibility of the lessee. 130 miles are included/night in the rental fees. The mileage is averaged over your entire trip. For a 10 night trip you have 1300 miles included. We allow a maximum of 260 miles/night. We do not offer unlimited mileage. Additional mileage up to 260 miles/night can be purchased by the mile ($0.39/mile) or by adding double mileage (260 miles/night – $25/night). You don’t have to decide ahead of your trip – the cheapest option for mileage overage will be calculated at your return. We want you to have flexibility on the road to change plans and not get penalized for that! If your trip exceeds 260 miles/night you will be charged $0.39/mile for every mile over the included 130 miles/night and purchasing double mileage will not be an option.